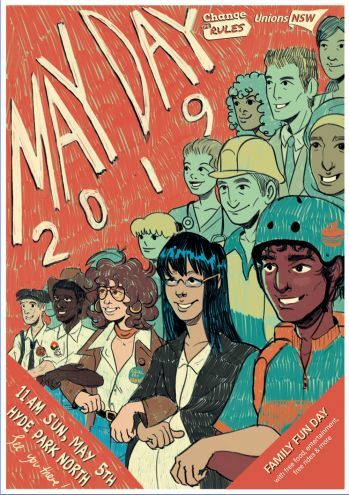 A strong showing is needed at May Day Change the Rules rallies to indicate to politicians that inequity will be an important issue for voters at the federal election. On a daily basis, teachers see the effect of the growing gap between rich and poor in Australia: students from families living in poverty, who may be homeless, have not eaten, suffer from trauma, need medical, dental and other health services. Underfunding of public schools results in these students and others with a range of additional needs not getting the learning and other support they need. Our Fair Funding Now! and Stop TAFE Cuts campaigns are an essential part of the overall Change the Rules campaign, focussing on the provision of equal educational opportunities for all students. Change the Rules rallies will be held across the country, to challenge and change federal policies and legislation that has increased the gulf between rich and poor in Australia. The combined union movement campaign is about addressing inequality of wealth, income and power in the workplace and Australian society. A report by the Australian Council of Social Services has shown the gap in household wealth grew between 2003 and 2015. The wealth of the richest 20 per cent of households increased by 53 per cent during this time, while in the poorest 20 per cent of households wealth fell by 9 per cent. This situation is the result of policies and laws that have increased job insecurity. Almost 40 per cent, or around 4 million, of Australian workers have insecure work. On top of this, state and federal laws have limited workers’ rights to bargain collectively and take collective action including the right to strike. The minimum wage in Australia is lower than the poverty line, estimated at $433 per week for a single adult and $909 for a family of four. Legislation in NSW and other states has capped wage increases and provision to increase wages based on work value. The increases above the cap can only be achieved by trading off conditions. We urge members across NSW to continue to actively campaign in the Fair Funding Now! and Stop TAFE Cuts campaigns as our key priorities for changing the rules. Details will be posted at news.nswtf.org.au and on social media towards the end of the April.